Lantus and Levemir are long-acting insulins that supply the background insulin needed to supply cells with glucose around the clock while preventing release of excess glucose from the liver and excess fat from fat cells. The waking glucose level best measures the activity of these insulins. All Type 1s and many Type 2s also require a faster insulin (Humalog, Novolog, or Apidra) to cover meals and lower any high glucose. Some Type 2s who have adequate insulin production do well with one of these long-acting insulins, plus oral medications or a daily or weekly injection of a GLP-1 agonist. 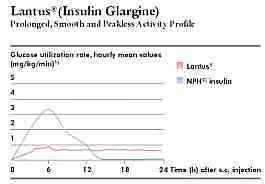 Lantus® insulin (glargine) made by Sanofi-Aventis is promoted as a once a day background insulin. However, many users find that it does not last a full 24 hours for them and these users often notice a peak in activity about 6-8 hours after the injection. If once a day injection is giving you good control, there is no need to change and a bedtime injection is typically best. For others, splitting the dose and injecting twice a day (usually at breakfast and bedtime) often works better, lessens peaks and gaps in activity, and helps those who cannot inject Lantus within one hour of the same time each day. Lantus is slightly acidic and some may notice slight discomfort at the injection site. Levemir insulin (detemir) made by Novo Nordisk works for about 18 hours and may have a peak in activity 4-6 hours after the injection. It is taken twice a day. Different people react to each insulin differently. The best advice is trying the other insulin if one does not seem to be working well for you. Both insulins generally work quite well, but neither can be mixed in a syringe with fast-acting insulin, and neither should ever be used in an insulin pump. Keep in mind that an older insulin called NPH can also provide very good results. NPH is less expensive, has a shorter action time, and is generally taken 3 times a day. One advantage of NPH is that it can be mixed in the same syringe with one of the rapid acting insulins. Humalog, Novolog, or Apidra is loaded into the syringe first, then the NPH, and the injection is given right away. With its shorter action time and more peaking, NPH is sometimes helpful to address a need for more or less insulin action at a particular time of day, such as afternoon sport practices or a morning Dawn Phenomenon. New insulins with action times measured in days rather than hours are being developed. These insulins appear to offer a slight reduction in the risk of hypoglycemia when taken once a day and greater convenience. Morning or night? Aventis recommends taking Lantus at bedtime, while Novo-Nordisk recommends taking Levemir once or twice a day. Lantus' actual duration of action is 18 to 26 hours, while Levemir is generally less than 22 hours. Although the timing of an insulin varies from person to person, it appears to be consistent in the same individual. One advantage to bedtime dosing is that if the insulin’s activity does not last 24 hours, the gap in activity happens after dinner and can be covered with extra Humalog, Novolog, or Apidra in the dinner injection. Consistent timing of the injection is critical if given once a day, so pick a time when you will remember to take the injection at the same time each day. The best way to eliminate gaps in insulin delivery when the insulin’s duration of action is less than 24 hours or when the timing of injections is erratic is to split dose into 2 equal injections a day at breakfast and either dinner or bedtime. This smooths out the uneven insulin levels that often occur with once a day dosing. Lantus and Levemir are clear insulins. Although the bottles have a different shape, some users have mistakenly injected a bedtime dose of fast-acting insulin rather than Lantus or Levemir! Be very careful not to confuse these long-acting insulins with your fast-acting clear insulin. Lantus becomes inactivated if it comes in contact with even small amounts of other insulins. This makes it appear hazy, so never use Lantus that is not crystal clear. How Do I Know When I'm On The Right Dose? One really nice feature of these insulins is that they make it easier to find the correct dose. Because of the very stable 24-hour action when a sufficient number of doses are given, the dose(s) is gradually increased until the fasting or before breakfast blood sugar has been normalized. If low blood sugars occur during the night and they are not being caused by a dose of fast-acting insulin taken during the evening hours, the dose(s) of long-acting insulin would be gradually reduced until the lows stop. Similar to the basal rate of an insulin pump, Lantus and Levemir doses can be checked by skipping a meal during the day. The best test for whether the dose is accurate comes from stable, flat overnight blood sugars. Once the Lantus dose has been determined, the doses of pre-meal Humalog, Novalog, or Type 2 medications would then be adjusted to keep post-meal blood sugars normal. With a stable background insulin, carb counting becomes especially helpful as a way to determine how much fast-acting insulin to take before each meal. This insulin analog was designed to have low solubility in water at a neutral pH, such as that found in body fluids and other insulins. Lantus becomes completely soluble only at an acid pH of 4. Once this is injected under the skin, the acidic solution is neutralized leading to the formation of micro-precipitates. The micro-precipitates allow small amounts of insulin to be released slowly. This release results in a relatively constant concentration/time profile over 22 hours +/- 4 hours with a minimal peak in activity. Those who experience a shorter action time, such as 18 or 20 hours, will also experience more peaking activity about 6 hours following the injection. Human insulin has two protein chains called A and B that have two zinc crosslinks between them. Lantus differs in that the amino aid asparagine at position A21 of the A chain is replaced by glycine, and two arginine molecules are added to one end of the B-chain. Occasionally, the acidic nature of this insulin may cause mild discomfort at the injection site in some individuals. This does not appear serious enough to cause users to discontinue the insulin. Like Humalog, Lantus is structurally different from human insulin, but it appears to rarely cause an immune or allergic response. Like any insulin allergy, the response can range from a mild local itching to a severe allergic reaction with swelling of the tongue, inability to breathe and shock or death if rapid treatment is not found. Lantus should be used with great caution and only under the supervision of a physician during pregnancy or prior to pregnancy. The vast majority of users get a consistent action from this insulin every day. However, Aventis' clinical studies did pick up some individuals who had marked differences in the action time for Lantus from one day to the next. In rare individuals, its action time was as short as 11 hours, but it is unknown why this difference occurs. Compared to human insulin, the last amino acid threonine in the B chain at B30 is clipped off in Levemir and a short fatty acid is attached to the amino acid lysine at B29. The structural change causes 98% of the Levemir molecules to strongly attach to albumin, a protein in the blood, providing Levemir with a long action time. Some peaking occurs between 4-12 hours after an injection, but in most individuals its activity flattens out over time when injected twice a day. This insulin analog has no acidity and is soluble at a neutral pH of 7.4. Lantus or Levemir may not work for everyone, but for the vast majority one or two injections a day can provide very good results.